And here's Alan, more or less upright. In the McGill Student Union Building, with guitar. 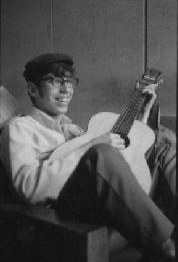 Coming to Montreal, knowing no one, the guitar was a handy prop; playing Dylan, Ochs, Tom Paxton (et al) on the grass on the campus or in the Student Union Building was an easy way to meet a bunch of people. The photo is from a contact sheet recently discovered by by Irvin Shizgal. More of Irvin's 1969 photos on Flickr.com.